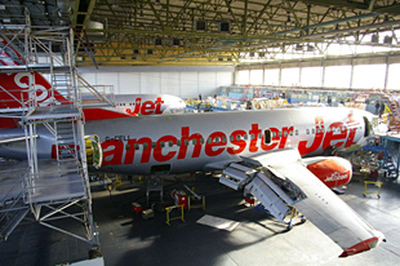 Jet2.com and Jat Tehnika have continued their cooperation as they signed extension of agreement for Base Maintenance of Jet2.com Boeing 737 fleet on next five years, starting from winter season 2012, up to 2017. The agreement extension has been signed today by Mr. Andy Menzies, Jet2.com Technical Director and Mr. Srdjan Miskovic, Jat Tehnika General Manager in Jat Tehnika Belgrade base. Jet2.com has been customer of JAT Tehnika since 2007. For the first four seasons Jat Tehnika has performed more than 30 heavy maintenance checks on Boeing 737 Classic aircraft including modifications, corrosion prevention program and various repairs, component and engine maintenance. Jat Tehnika looks forward to increase and consolidate good and professional relationships with Jet2.com Company as it has been recognized as one of the key players on demanding UK airline market.